Poking at your smartphone before bed makes it harder to fall asleep because the cool, bluish glow of its screen tricks your body think it’s daytime. Warmer tones are the key to drifting off, so Philips is introducing a new white bulb to its Hue line that can be adjusted from cool to warm color temperatures to help your body wind down at night. The Philips Hue White Ambiance bulbs cover the color temperature range from as low as 2200K, which is closer to the warm glow of the sun at sunrise and sunset, to as high as 6500K, which mimics the cooler tones of the sun high in the midday sky. In comparison, most white lightbulbs have a slightly higher color temperature of around 2700 to 3000K, including the basic Philips Hue White bulbs, which can’t be adjusted. The warmth of the bulbs can be tweaked through the Philips Hue app, which also provides access to automated ‘Routines’ so you can program the White Ambience bulbs to slowly brighten in the morning to ease your body into being awake, or slowly dim like the setting sun at night while you’re in bed to make it easier for your body to fall asleep. 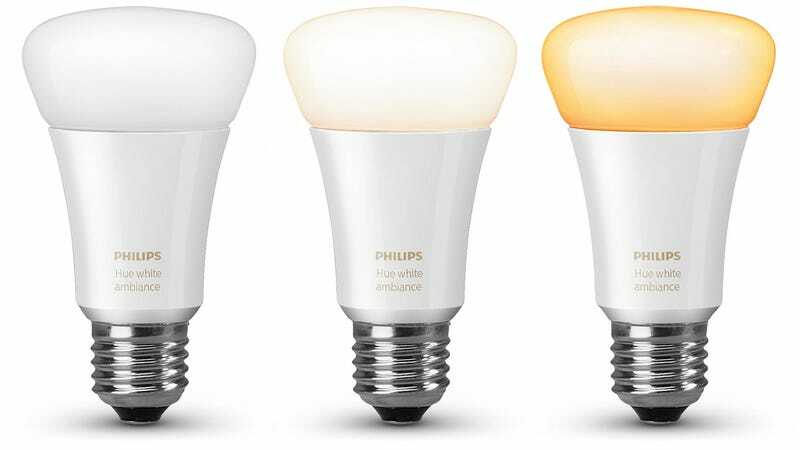 Available individually, or as part of a White Ambiance Starter Kit that includes a dimmer switch and the Hue wi-fi hub, Philips hasn’t yet revealed details on when the bulbs will be available, or for how much. But given they’re only able to produce white light, expect them to fall somewhere between the basic $15 Philips Hue White E27 bulbs, and the $60 Philips Hue A19 bulbs which are instead capable of producing 16 million different colors. Unless you live in a night club, the new White Ambiance bulbs are probably all you need.